Another simple canapé idea, this time using Goatsbridge Trout Caviar. The combination with avocado has to be tried to be believed, it’s sublime. Lightly toast some wholemeal bread, trim the crusts, cut into dainty rectangles or triangles and place to one side. 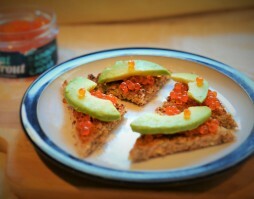 Using a teaspoon, carefully heap the caviar onto the toast. Peel an avocado, cut in half then thinly slice. You can tell when an avocado is ripe by gently squeezing the ends. If it gives a little it’s ready, if it gives too much it’s likely overripe and the flesh may have black spots. If this happens garnish with a thinly sliced black olive. Place the avocado on top of the Goatsbridge Trout Caviar. Serve immediately. These tasty trout bites would go wonderfully with the Goatsbridge Trout Pate canape mentioned in our recipe section. If you liked this easy recipe you can buy our trout caviar from our online shop or in all good Irish supermarkets, including Supervalu and Dunnes Stores as well as specialist shops around the country. For more Goatsbridge trout recipes, news or competitions sign up for our newsletter.